Monthly releases were dominated by the payrolls report, which disappointed only in that it wasn't more of a blowout than January, which was revised up to +284,000 jobs. The household survey showed over 400,000 jobs added. This survey has shown a surge of 2.448 million jobs in the last 8 months, worth noting because the household survey often leads at inflection points. The participation rate increased 0.2%. Had it remained constant, the unemployment rate would have fallen to 8.0%. 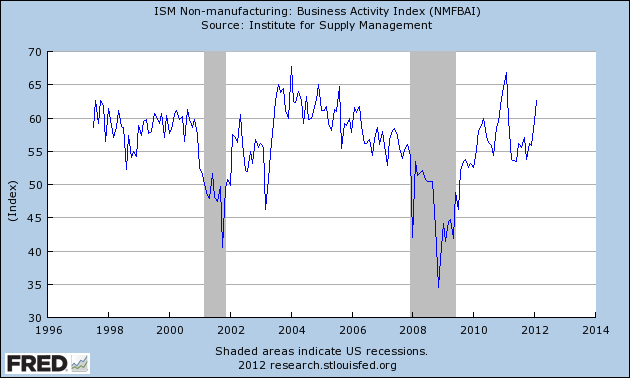 The manufacturing workweek, a leading indicator, increased. In other news, factory orders declined but less than anticipated. Labor productivity stalled, which is actually good for the addition of more jobs. Turning to the high frequency weekly indicators which I watch because any turning pointwill show up in these indicators first. This week they were all mixed up, but importantly several warning flags of flagging consumer demand in the face of rising gas prices have been raised. The Mortgage Bankers' Association reported that the seasonally adjusted Purchase Index increased +2.1% from the prior week, although it was still -7.8% lower YoY. 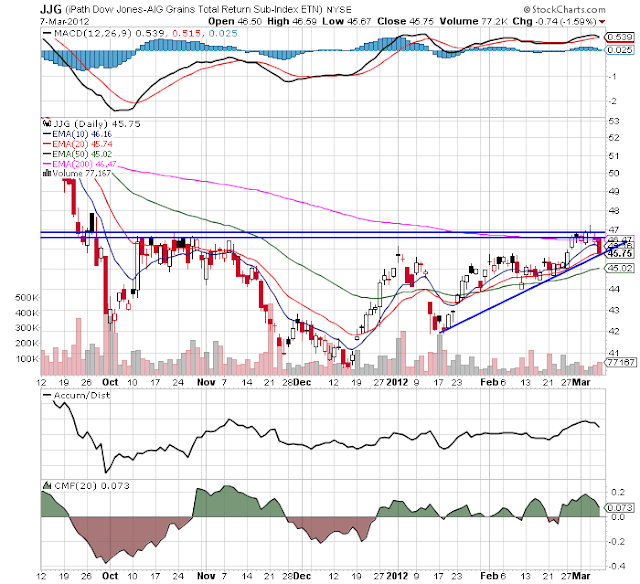 This continues its rebound from the bottom of its nearly two year range. The Refinance Index decreased -2.0% from the previous week, still near its highest level in over half a year. YoY weekly median asking house prices from 54 metropolitan areas at Housing Tracker were again up +3.9%. This number has stabilized on a YoY basis for a month, which is what I would have expected. 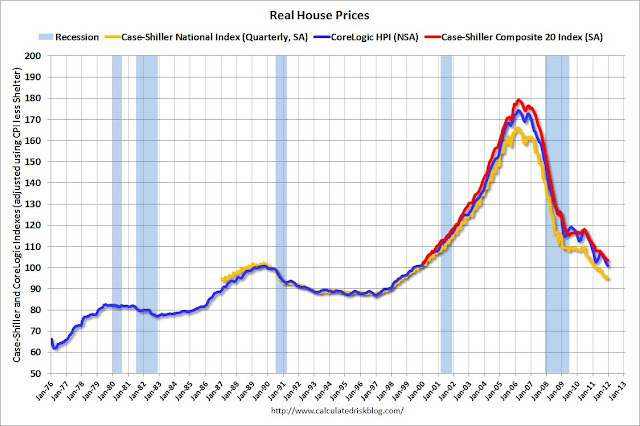 It remains at odds with the Case-Shiller reports of worsening YoY declines in price for comparable sales. One of the two is going to turn. Weekly BAA commercial bond rates declined -0.8% t0 5.07%. Yields on 10 year treasury bonds fell -0.4% to 1.97%. The credit spread between the two, which had a 52 week maximum difference of 3.34% in October, tightened again this past week to 3.11%. Once again, narrowing credit spreads are not at all what I would expect to see if we were going into a recession. The Daily Treasury Statement showed that for the last 20 reporting days ending 6 days into March, on March 8, 2012, $156.7 B was collected vs. $152.1 B for the eequivalent 20 day period in 2011, an increase of 3.0%.. The American Staffing Association Index rose to 87 again last week. It remains midway between its 2011 and 2007 levels. Seasonally we want to see this move slightly higher over the next few weeks. The Department of Labor reported that Initial jobless claims rose to 362,000 last week. The four week average increased 1000 by 355,000. These are still close to the lowest reading since spring 2008. M1 declined -0.2% last week, and also fell -0.4% month over month. On a YoY basis it fell to +18.5%, so Real M1 is up 15.6%. YoY. M2 was flat for the week, and rose a tiny +0.1% month over month. Its YoY advance fell to +9.8%, so Real M2 was up 6.91%. In short, real money supply indicators continue slightly less strongly positive on a YoY basis, although not so much as in previous months, and have generally stalled in the last couple of months. Rail traffic was negative but with an explanation. The American Association of Railroads reported a 5000 car decline in weekly rail traffic YoY for the week ending March 3, 2012. Intermoal traffic was up 13,000 carloads, or +6.0%, but other carloads decreased 19,000, or -6.2% YoY. Last week I included a graph from Railfax and said it would be troublesome if the data did not turn up. This week it turned up. The entire decline in carloads is due to coal shipments which were off 23,000 carloads or -16.6%. It appears that a warm winder, coupled with cheap natural gas prices, caused a cliff-dive in demand from power stations. Still, the decline in mining and shipment of coal is still a decline in economic activity. Finally, the JoC ECRI industrial commodities index fell from 128.13 to 126.00. This is a strong decline in what is almost certainly the most heavily weighted component of ECRI's WLI, and suggests there will be a significant decline when that index is reported next Friday. 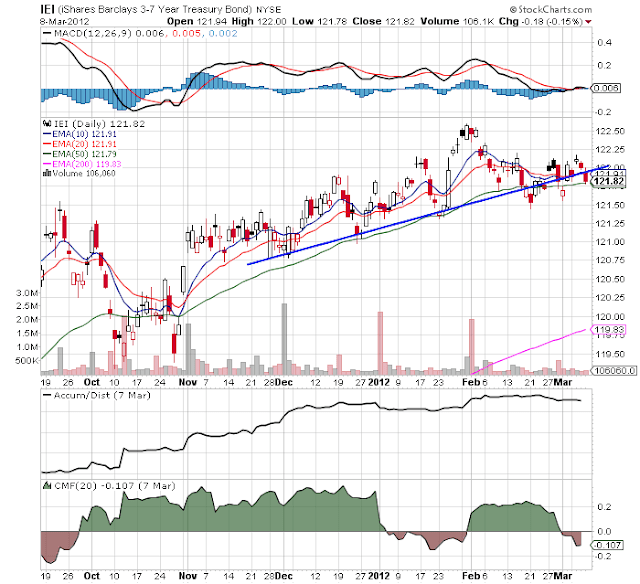 The TED spread is at 0.390 down from 0.410 week over week. 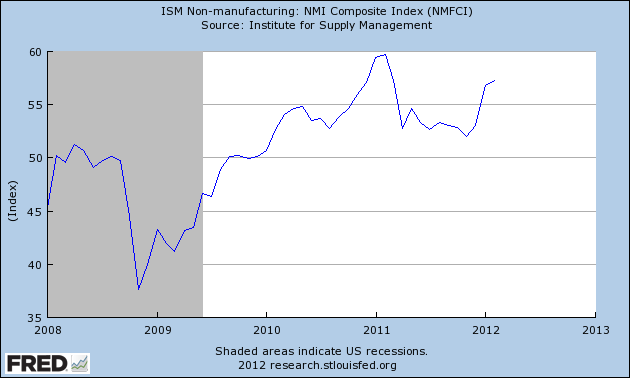 This index remians slightly below its 2010 peak, and has declined from its 3 year peak of 2 months ago. The one month LIBOR is at 0.242, down .001 from one week ago. It is well below its 12 month peak set 2 months ago, remains below its 2010 peak, and has returned to its typical background reading of the last 3 years. The Baltic Dry Index at 824 was up 53 from 771 one week ago, and up 174 from its 52 week low, although still well off its October 52 week high of 2173. The Harpex Shipping Index was flat at 376 in the last week, still up 1 from its 52 week low. Please remember that these two indexes are influenced by supply as well as demand, and have generally been in a secular decline due to oversupply of ships for over half a decade. The Harpex index concentrates on container ships, and led at recent tops and lagged at troughs. The BDI concentrates on bulk shipments such as coal and grain, and lagged more at the top but turned up first at the 2009 trough. This is a replay of last year, when Oil's choke collar brought an accelerating recovery to a virtual standstill. Most of the usual leading indicators continue to give positive signals. But the further cutback in gasoline usage, and the admittedly only one data point showing definite slowing in retail sales are like thunder in the distance. The most important report to watch this week will be Tuesday's retail sales. Expectations are high, for more than a 1.0% increase. An increase of +0.5% or higher, while "disappointing," will still most likely be positive after inflation is reported Friday. Any report of +0.2% or less, however, should be treated like a siren warning of an approaching storm. 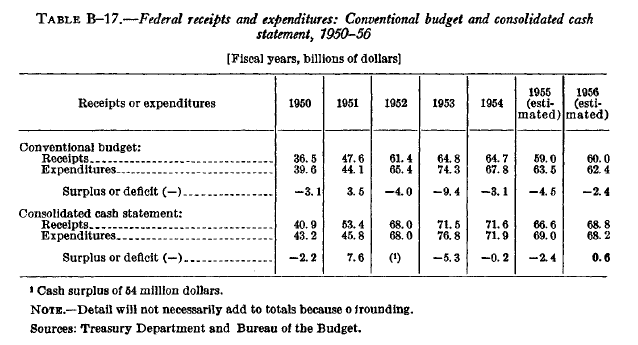 The above chart places total federal spending in perspective; we see a big increase in spending as a result of the Korean War. 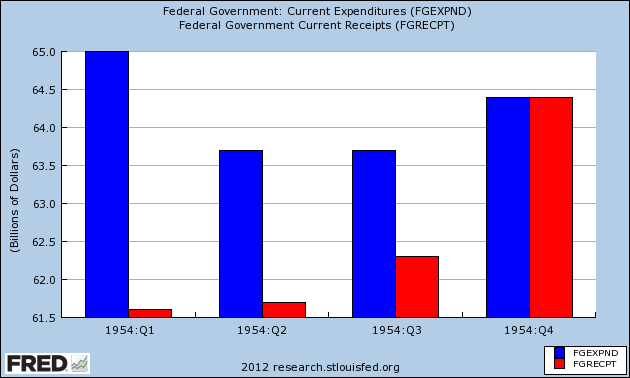 Then we see a continued increase in spending to stimulate the economy out of recession. 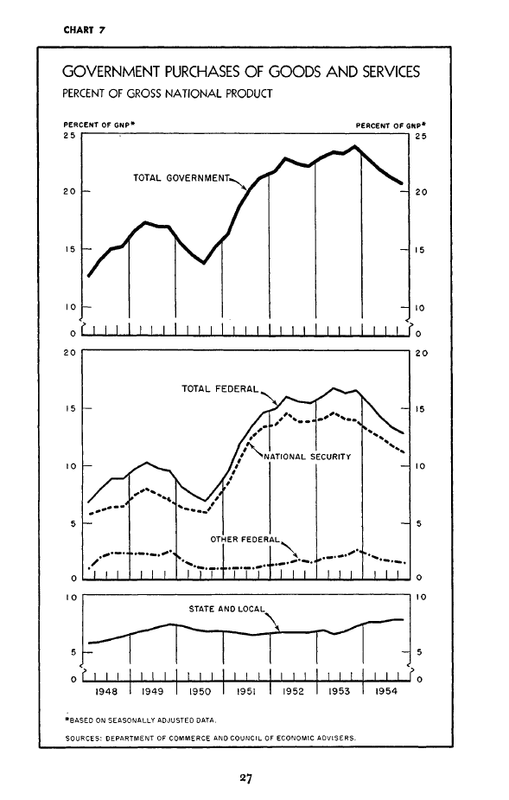 However, government spending drops throughout 1954. In the above chart, we simply see the actual numbers for expenditures and receipts. 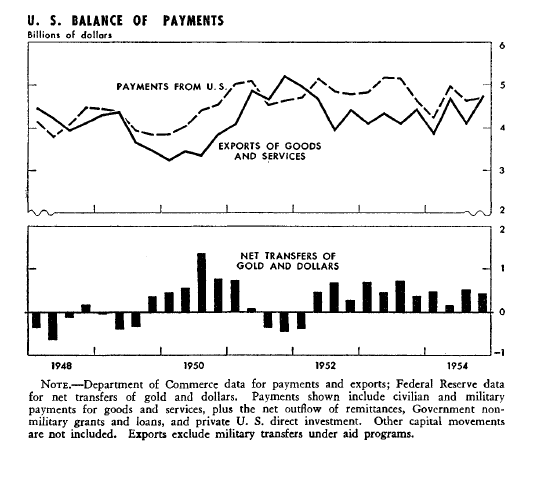 As the chart above shows, the government ran a deficit for the year. However, we see that spending and revenue were equal in the 4Q. Remember that there were a number of tax cuts that went into effect to get the economy out of recession. 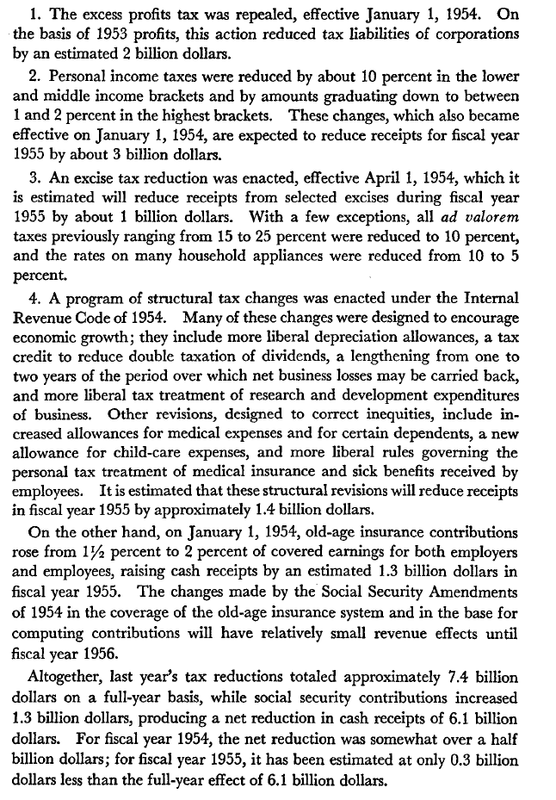 Remember -- tax rates were far higher during this decade. 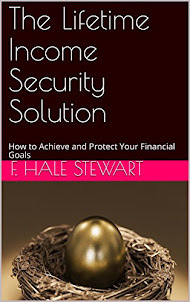 In addition, the government spend a a fair amount of money in conjunction with the tax cuts as a way to increase income during the recession. This led to an actual increase in overall net income at the national level, thereby helping to prevent the recession from continuing. 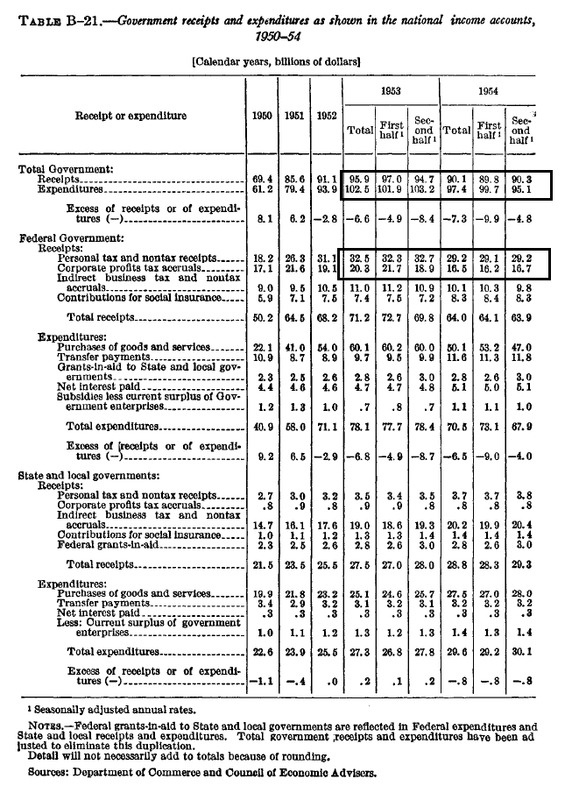 Remember -- tax receipts closely track GDP. Of the Districts reporting on hiring, most indicated a slight increase. Boston, New York, Cleveland, Richmond, St. Louis, and Minneapolis reported increased hiring in manufacturing, and contacts in Philadelphia and Kansas City anticipate future hiring in the sector. Several businesses in the Atlanta District also reported plans to increase payrolls. Philadelphia, Kansas City, and Dallas noted increased hiring among auto dealers. Contacts in Boston, Cleveland, Richmond, Chicago, Kansas City, and Dallas were having difficulties finding skilled or specialized workers in a variety of industries. In contrast, Boston manufacturing contacts reported fewer complaints about being unable to find qualified workers. Chicago noted that hiring remains selective and long-term unemployment elevated, while San Francisco noted limited demand for new workers. Staffing firms in Boston noted that the hiring cycle remains "elongated" despite stronger demand. Staffing firms in Dallas also noted high demand, while a major employment agency in New York indicated flat hiring. Among Districts commenting on wages, upward pressures appeared limited. Boston noted limited pay rises in retail and manufacturing. Richmond reported some upward wage pressures in the service sector and manufacturing. Dallas and San Francisco reported minimal wage pressures, although upward pressure for certain specialized positions was reported in both Districts. Similarly, wage pressures remained largely subdued in Kansas City except for high-tech and energy positions. Wage pressures were modest or largely contained in Cleveland and Dallas, while Philadelphia noted flat wages and Minneapolis reported modest wage increases. New York noted that Wall Street compensation remains under downward pressure. Initial jobless claims have been below the 400,000 level for a few months now. 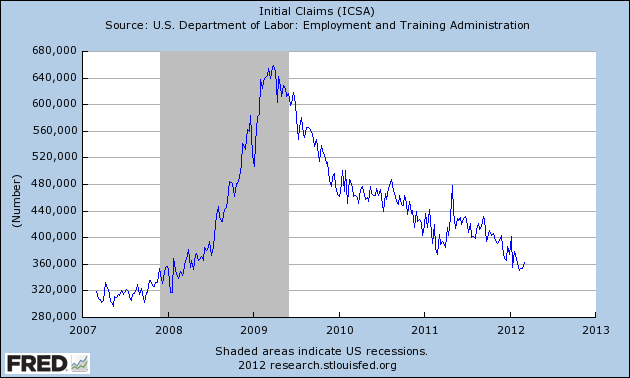 Notice the overall trend; claims dropped sharply right after the official end of the recession. They leveled out at two levels -- first between 440,000 and 480,000 for the first 2/3 of 2020 and then between 400,000 and 440,000 for most of last year. 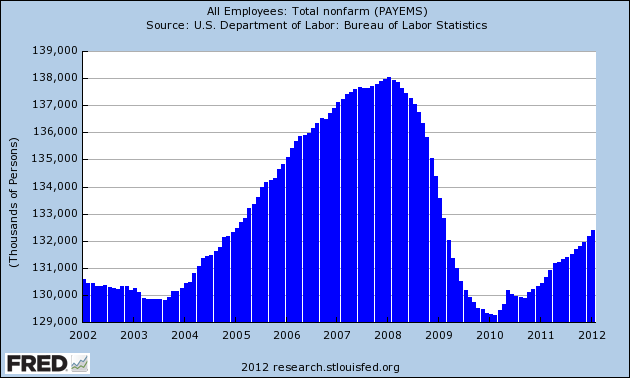 Total establishment jobs have been steadily moving upwards since about the middle of 2010. While there is still a great deal of progress to be made, things are definitely on the right track. The unemployment rate, which at its highest point was at 10%, is still far too high, but is moving in the right direction. 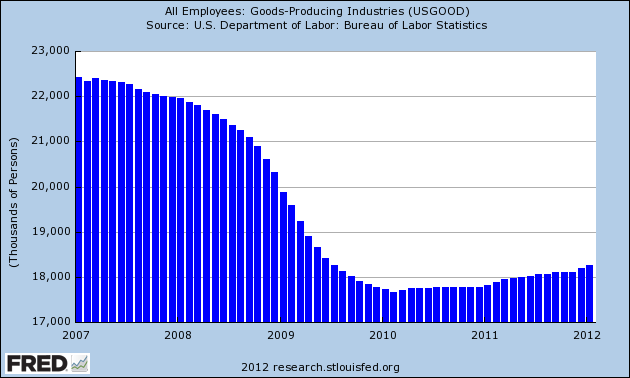 Good producing jobs have increased over the last two years, but not by much. This is part of the longer-trend issue of manufacturing becoming far more automated over the last twenty years. Service sector jobs are clearly where most of the job growth has been over the last two years. accounting for a little over 2,000,000 jobs added. 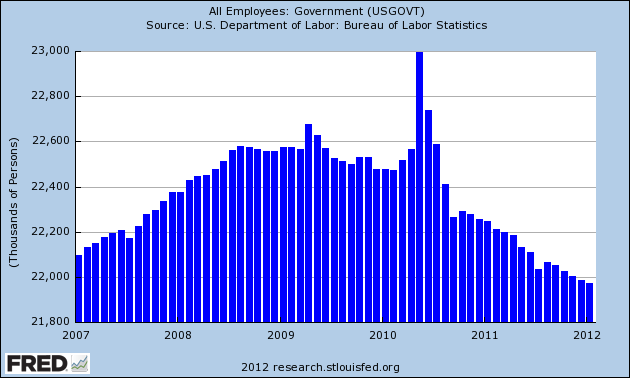 Note that government jobs continue to decline. 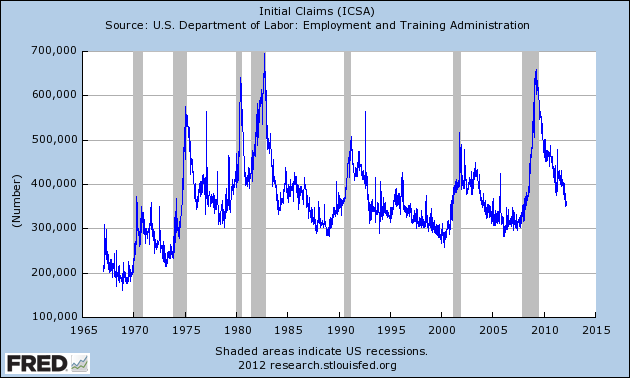 As I've stated before, I think this is the main reason for initial claims being at high levels for an extended period of time. First, overall these are good numbers. We're over 200,000 in job growth and we're seeing broad based job growth. The overall unemployment rate is clearly moving lower. I've blocked off the establishment job growth chart into three areas. At the end of 2010 and beginning of 2011 we see four of seven months increasing by over 200,000. Then we see the rest of last year with sub-par growth. This was caused by two events: Europe and high gas prices. Over the last three months, we're back to where we were at the end of 2010/beginning of 2011. The good news is Europe is less of an issue (at least for now). Gas remains the wild card. Let's turn to the household survey. Overall, these are also good numbers. First, note the rate of labor under-utilization is steady. That's means that, at minimum, we're not getting any worse. 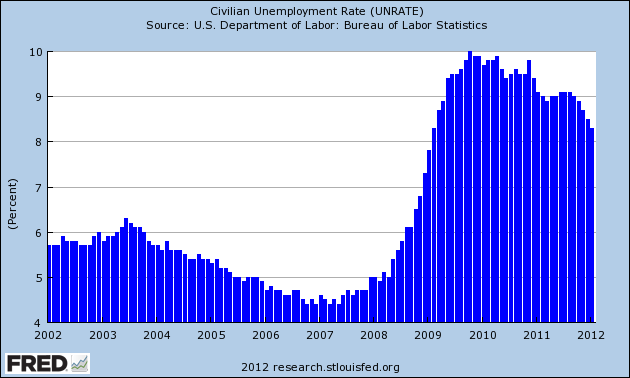 The LPR increased (much to the consternation of right wing "economic" commentators) as did the number of employed. In fact, the household survey's employment numbers have been incredibly strong over the last few months. showing very strong gains. Professional and business services added 82,000 jobs in February. Just over half of the increase occurred in temporary help services (+45,000). Job gains also occurred in computer systems design (+10,000) and in management and technical consulting services (+7,000). Employment in professional and business services has grown by 1.4 million since a recent low point in September 2009. Health care and social assistance employment rose by 61,000 over the month. Within health care, ambulatory care services added 28,000 jobs, and hospital employment increased by 15,000. Over the past 12 months, health care employment has risen by 360,000. In February, social assistance employment edged up (+12,000). In February, employment in leisure and hospitality increased by 44,000, with nearly all of the increase in food services and drinking places (+41,000). Since a recent low in February 2010, food services has added 531,000 jobs. Manufacturing employment rose by 31,000 in February. All of the increase occurred in durable goods manufacturing, with job gains in fabricated metal products (+11,000), transportation equipment (+8,000), machinery (+5,000), and furniture and related products (+3,000). Durable goods manufacturing has added 444,000 jobs since a recent trough in January 2010. In February, mining added 7,000 jobs, with most of the gain in support activities for mining (+5,000). Since a recent low in October 2009, mining employment has increased by 180,000. Construction employment changed little in February, after 2 consecutive months of job gains. Over the month, employment fell by 14,000 in nonresidential specialty trade contractors. Overall, employment in retail trade changed little in February. A large job loss in general merchandise stores (-35,000) more than offset an increase in January (+23,000). Employment in motor vehicle and parts dealers continued to trend up in February. Government employment was essentially unchanged in January and February. In 2011, government lost an average of 22,000 jobs per month. Again -- we see broad based gains. Here, we'd like to see more improvement. However, with a high unemployment rate, we're not going to get a lot of supply side related issues on wages or hours. Overall, 8 out of 10. Good report. 1. Like everybody else, I'm impressed with the upward revisions to December and January. You don't get upward revisions like this in a weakening economy. I suspect today's number will be upwardly revised as well. 2. The manufacturing workweek, a leading indicator, ticked up another 0.1 to 41.0 hours. Factory workers are working more hours than at any time in more than a decade. This is a white hot number. 3. The index of aggregate hours worked increased from 95.5 to 95.7. Aggregate hours continue to outpace payroll reports, but are probably already beginning to be translated into a faster pace of increased jobs. 4. The labor participation rate increased, even with more people entering the workforce. This number is no longer bouncing along the bottom, but has significantly improved over the last half year or so. 4. The number of jobs added per the household report was 428,000. Since this number is more volatile than the establishment survey number, it rarely gets reported. But even after accounting for the population adjustment in January, according to this survey 2,448,000 new jobs have been created in the last 8 months! That's over 300,000 a month. Since the household survey typically leads the establishment survey at inflection points, this is an extremely bullish development and argues for further upward revisions in the establishment survey. In short, the household survey number shows that we are finally really making progress on the jobs lost ruding the recession. Dear Rush: 851,000 Jobs Created in February!!! Last month Rush Limbaugh (among many others on the "I will only report numbers that back up my worldview" train) made it very clear that he only trusts the non-seasonally adjusted job creation numbers from the Employment Situation Summary (this having nothing to do with the fact that January numbers are always in the negative millions thanks to holiday layoffs). So, I have challenged Mr. Limbaugh to only report the non-adjusted data for the rest of the year (I know, highly unlikely) and with this month being the first chance to do so, I wanted to point out that the non-adjusted gain for February (from the unadjusted January number) was a whopping +851,000 (or +740,000 if Rush prefers the Household Survey) jobs! That's right, in unadjusted terms, we had an absolutely blowout February for job creation in the United States. 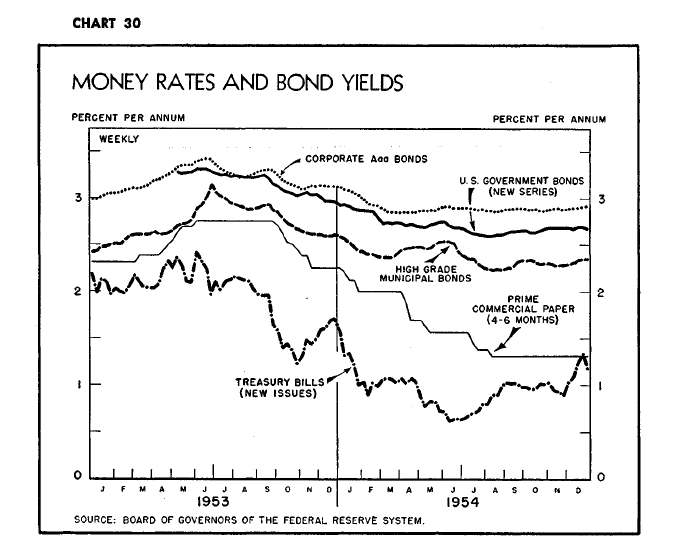 Above are the charts for the treasury market, starting with the shortest maturity and going to the longest. 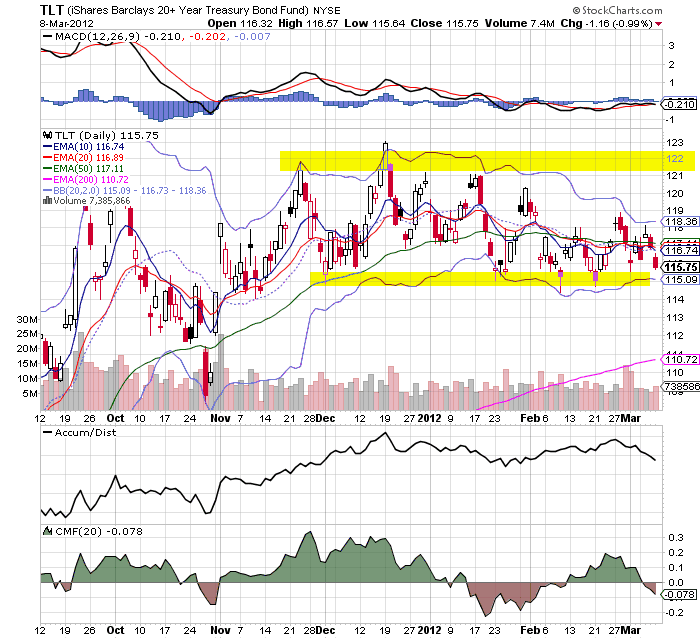 The shorter maturities are at support again, while the TLTs are approaching support. The IEFs have a bit to go. 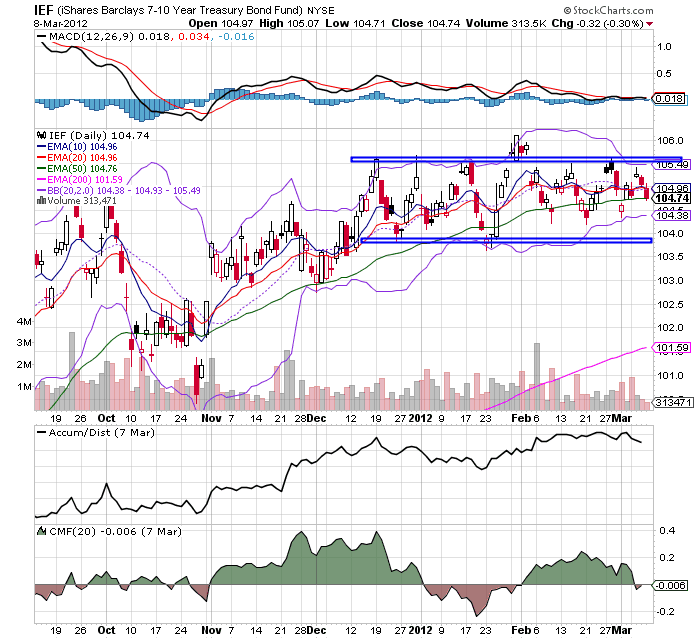 The point is money needs to leave the treasury market to provide fuel for the stock market to get the equity markets to stop correcting. However, the charts above say that won't be happening yet. The IWMs represent the riskiest areas of the equity market, so their position gives us an idea for where we might be in the correction cycle. Prices have rebounded that last two days and are currently approaching both the 50% Fib level and resistance established during February. On the daily chart, prices have rebounded into the 10 and 20 day EMA -- both of which are heading lower. Additionally, the 10 is now below the 20. 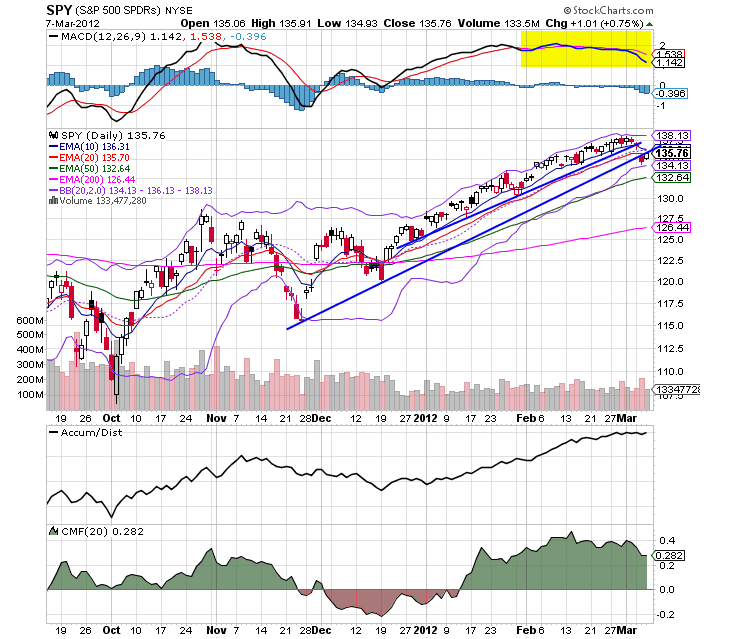 While the MACD is moving lower, the volume indicators are not showing a mass exodus from the market. 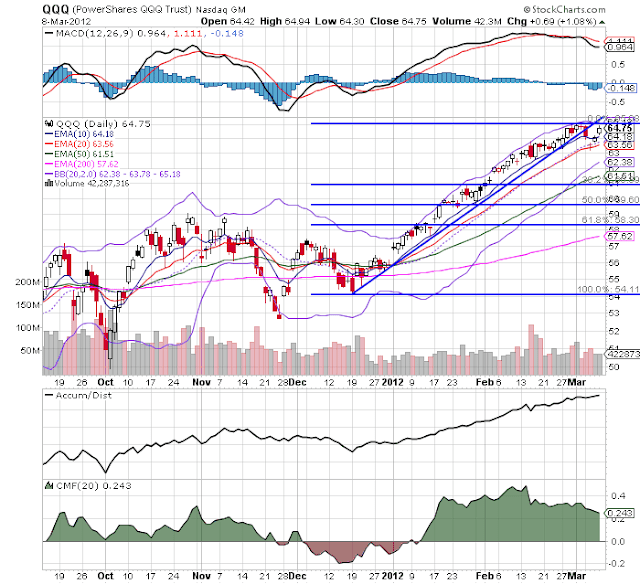 Note the QQQ's have risen to near previous highs. 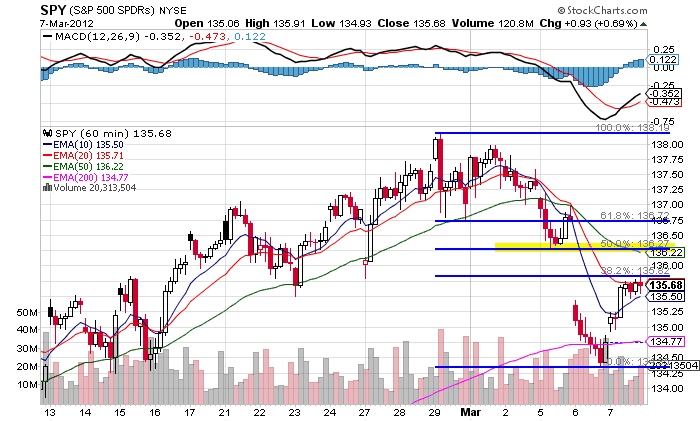 The SPYs, meanwhile, have rebounded above 30 minute Fib levels. The junk bond market has broken support and is headed for either the 50 day EMA or the support established in late October of last year. 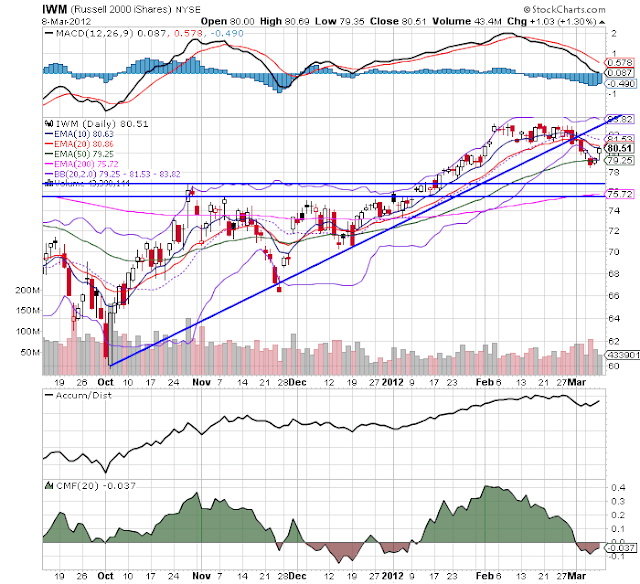 Nothing in the above charts shows any kind of serious, long-term damage to the markets. Instead, everything looks like the standard sell-off in the middle of a rally. 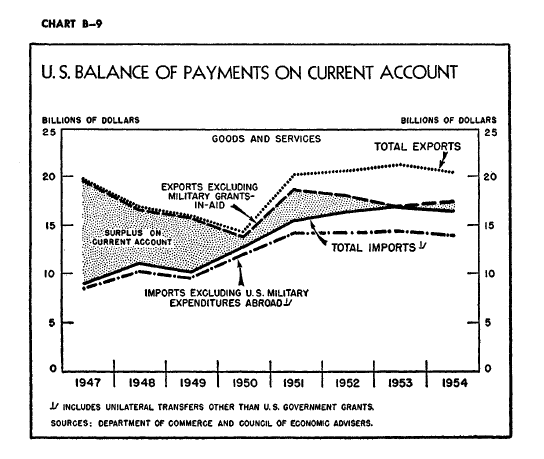 The US was a net exporter in 1954. 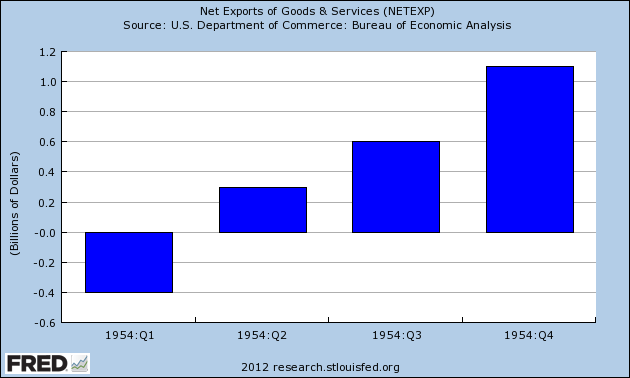 While the first quarter printed a net inflow, the next three quarters showed a net exporting position. This is due to two factors. While we see a big import position in the second quarter, that number dropped in the third and fourth quarters. 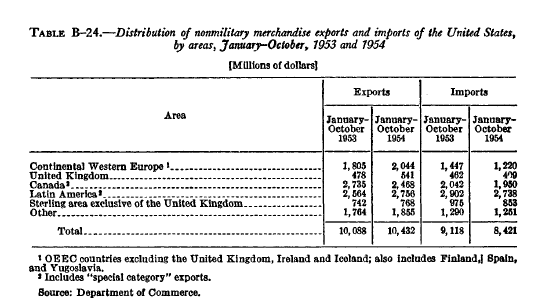 The above chart shows the importance of US military exports, which had a tremendous effect of trade overall. 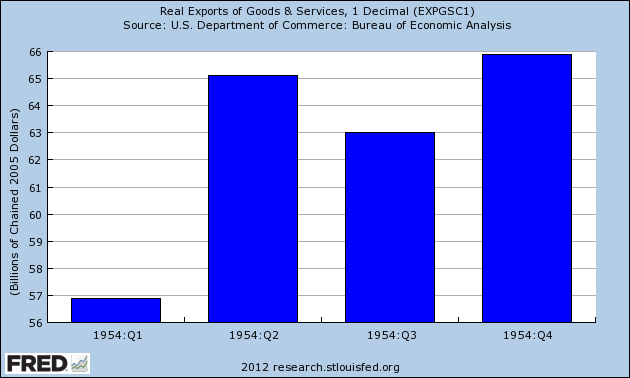 The above chart from the Economic Report to the President shows the breakdown of world trade. 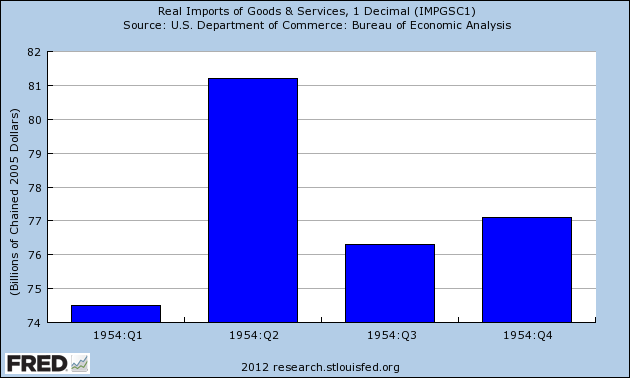 Note the importance of Latin America, which accounted for about 30% of our trade in the year. 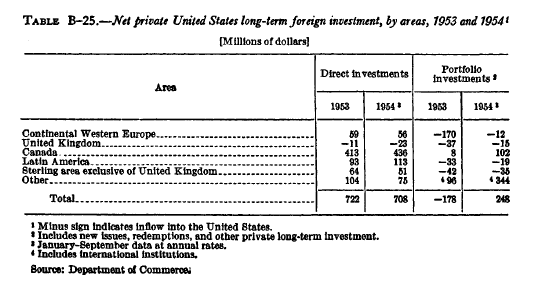 Note the tremendous outflow of private direct investments into a variety of areas in both 1953 and 1954. Also note the pick-up in portfolio investments. I haven't updated the Shadow Weekly Leading Index in a few weeks, but during that time ECRI's WLI has generally continued positive, and its yearly Growth index is within shouting distance of turning positive. 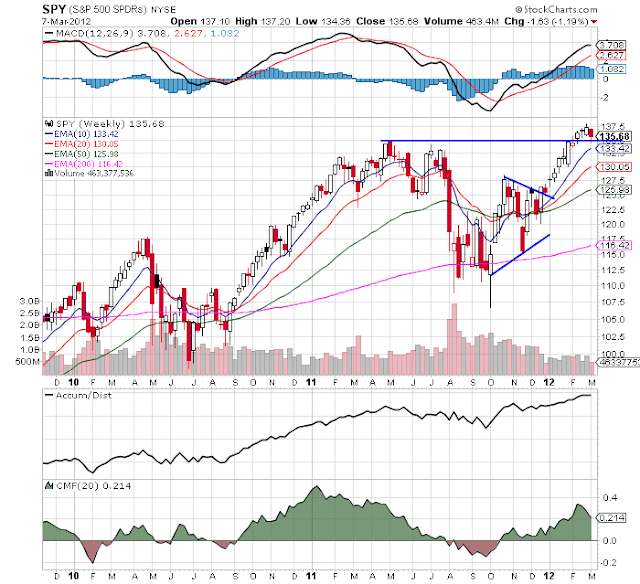 The S&P 500 rose +0.3% last week. Every single one of the above is a positive for the index. So far, this week the unweighted average change is +0.9%. Barring a very, very bad number in either weekly jobless claims or money supply, it appears that there is going to be a solid advance in ECRI's WLI when it is reported tomorrow - especially if commodity prices and credit spreads are the most heavily weighted components. Others have calculated that the WLI growth index appears to be a function of comparing the last 4 weeks' average with the 52 week average. Since the last 4 weeks have featured continued advances in the weekly index, and the 52 week average is a decline, this suggests another strong advance in the growth index, moving it substantially closer to positive territory. Nonfinancial services activity was stable or increased in the New York, Philadelphia, Richmond, Atlanta, St. Louis, Minneapolis, Dallas, and San Francisco Districts. Transportation services were stable or trending higher in the Cleveland, Richmond, Atlanta, and Dallas Districts. In contrast, freight transportation contacts in the St. Louis and Kansas City Districts reported that business had slowed. Information technology service firms in the Boston, St. Louis, Kansas City, and San Francisco Districts have experienced increased demand since the previous reporting period. Additionally, contacts in health care announced plans to increase capital spending or expand operations in the Richmond and St. Louis Districts. The business activity index has also spiked recently, indicating a more active environment. The report was issued today by Anthony Nieves, C.P.M., CFPM, chair of the Institute for Supply Management™ Non-Manufacturing Business Survey Committee. "The NMI registered 57.3 percent in February, 0.5 percentage point higher than the 56.8 percent registered in January, and indicating continued growth at a faster rate in the non-manufacturing sector. The Non-Manufacturing Business Activity Index registered 62.6 percent, which is 3.1 percentage points higher than the 59.5 percent reported in January, reflecting growth for the 31st consecutive month. The New Orders Index increased by 1.8 percentage points to 61.2 percent, and the Employment Index decreased by 1.7 percentage points to 55.7 percent, indicating continued growth in employment, but at a slower rate. The Prices Index increased 4.9 percentage points to 68.4 percent, indicating prices increased at a faster rate in February when compared to January. According to the NMI, 14 non-manufacturing industries reported growth in February. The majority of comments from the respondents reflect a growing level of optimism about business conditions and the overall economy. There is a concern about inflation, rising fuel prices and petroleum-based product costs." 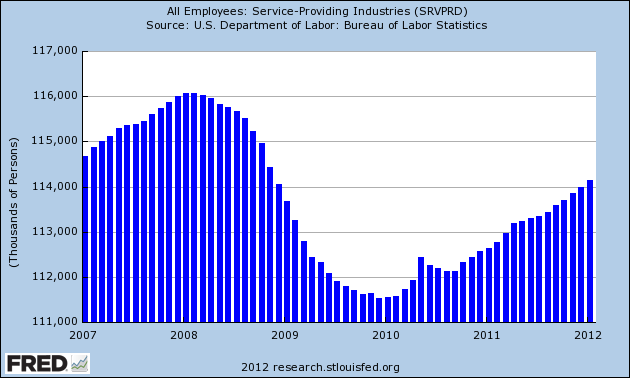 Short version: the service sector is looking pretty good right now. So -- the markets are in a correction. Let's look at the charts to see what important levels we can discern. 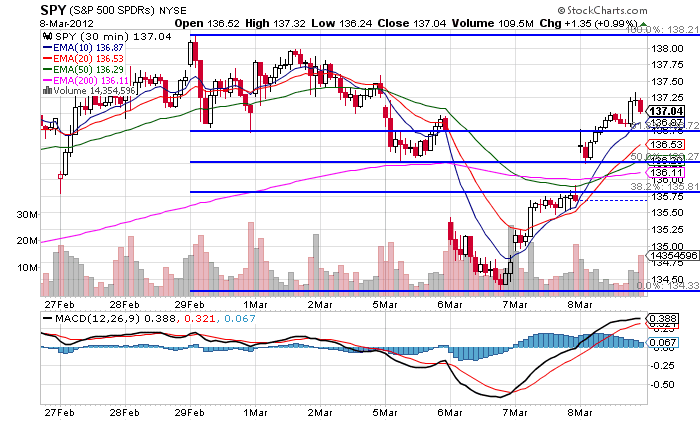 The weekly chart shows there is support at the 135 level, which was established in early November of last year. However, notice the long-term trends as expressed by the EMAs are still bullish, the MACD is rising and the volume indicators show money flowing into the market. The 60 minute chart shows that prices are rebounded to the 38.2% Fibonacci level and that the 50% level is right around resistance levels. On the daily chart, notice that support has become resistance. 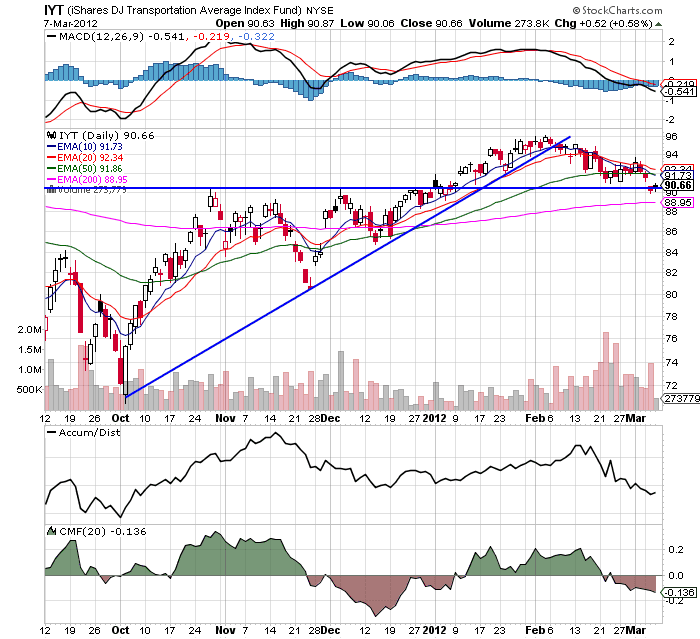 The transports, which were the first index to show signs of weakness, are now at longer-term support. Also note the shorter EMAs are turning lower. 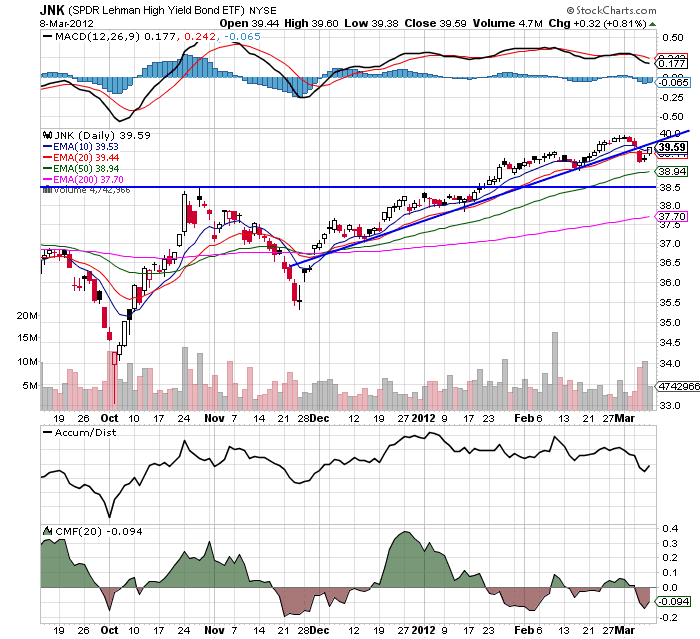 A move through this level would make the 200 day EMA the next support level. 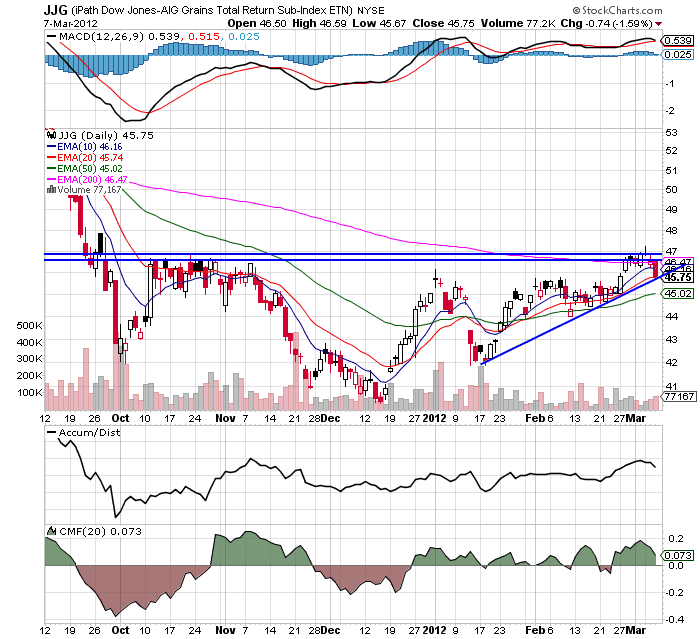 Grains have hit resistance and have sold off to support. Yesterday's move was very large and obviously very important. As food prices are one of the areas I watch as possible contributors to a slowdown, this is good news. 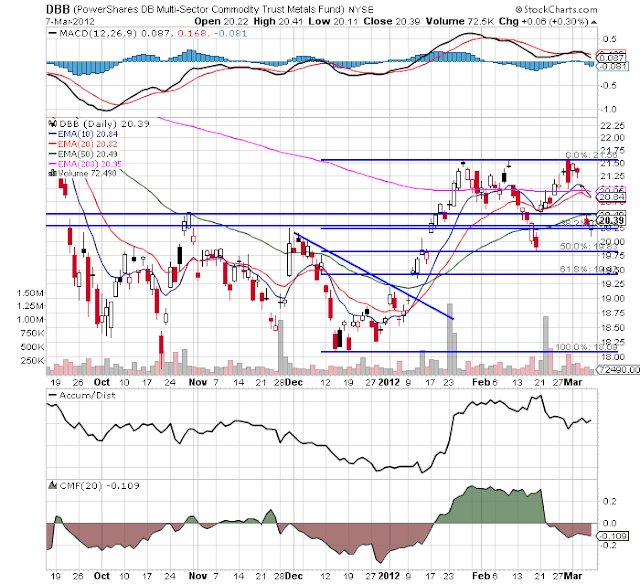 Industrial metal have again been rebuffed from resistance levels and are sitting on Fib levels. The above charts show that the markets are moving more clearly into correction mode. Metals have sold off; the transports continue to move lower, the SPYs have rebounded, but into resistance. The year over year percentage change in PPI was mild for the first half of the year and negative for the second -- albeit very slightly negative. 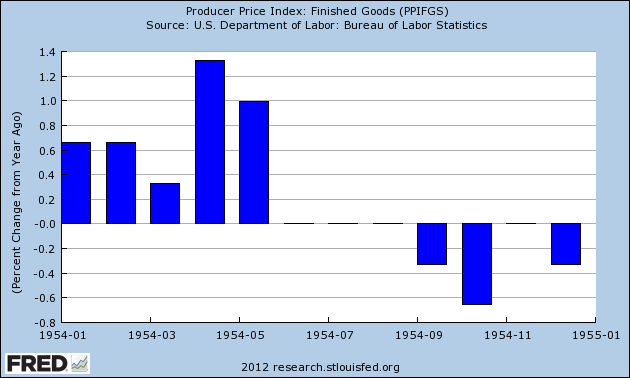 The year over year percentage change in CPI showed the exact same pattern as PPI. 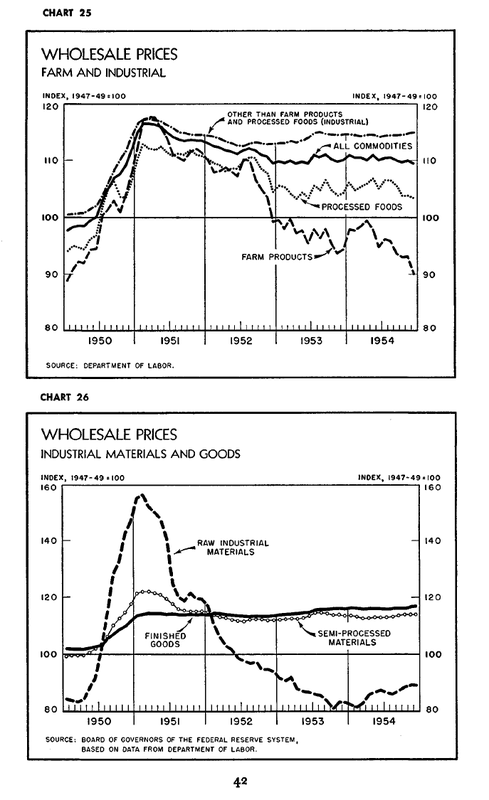 Remember that in early 1951, Congress passed a price control act as a way to prevent price spikes during a time of war. 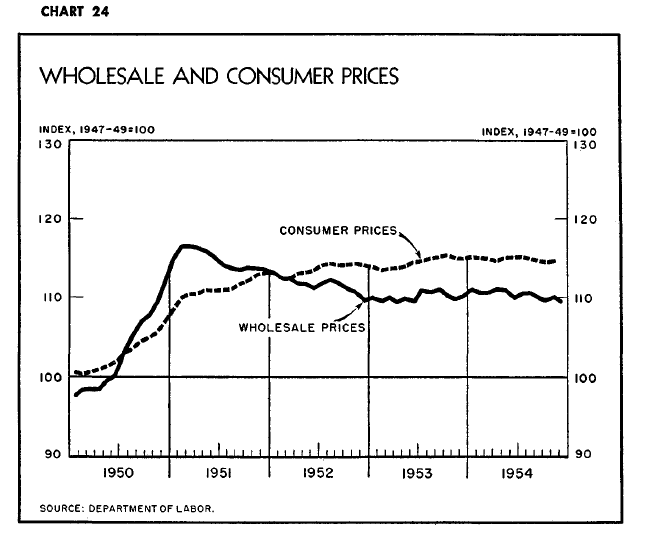 Also remember that there were wage and price panels that monitored and set prices for a bit of time after the passage of that act. Residential real estate activity increased modestly in most Districts. Boston, Cleveland, Richmond, Atlanta, Kansas City, and Dallas reported growth in home sales, while New York noted steady to slightly softer home sales. Philadelphia reported strong residential real estate activity. 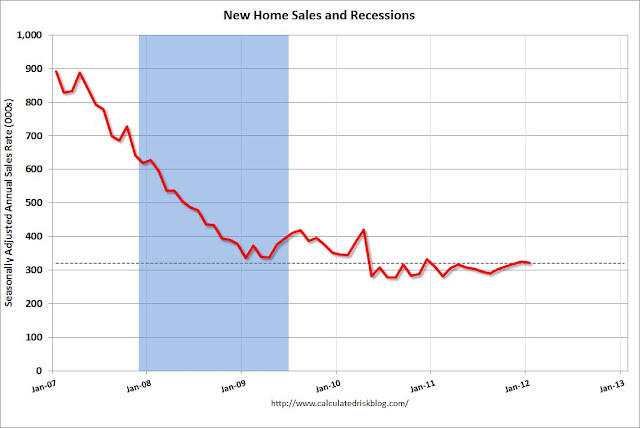 In contrast, home sales declined in St. Louis and San Francisco noted that home demand persisted at low levels. Contacts' outlooks on home sales growth were mostly optimistic. Contacts in Boston, Philadelphia, Atlanta, and Dallas expect home sales to rise further. Home prices declined or held steady in many areas. Cleveland and Atlanta reported little movement in house prices, while contacts in Boston, New York, Philadelphia, Richmond, Chicago, and Kansas City reported some declines. Single-family residential construction was weak in Chicago and declined in St. Louis; Cleveland noted that the year-end uptick seen in construction has abated somewhat, and Minneapolis noted increased single-family building permits. In contrast, Boston, Atlanta, Chicago, Minneapolis, Dallas, and San Francisco reported increased multifamily construction activity. Let's look at the charts, all of which are from Calculated Risk. Let's start with the new home market, which is the smaller of the two. In short, there is no place to go from here but up. However, when that will be is a mystery. 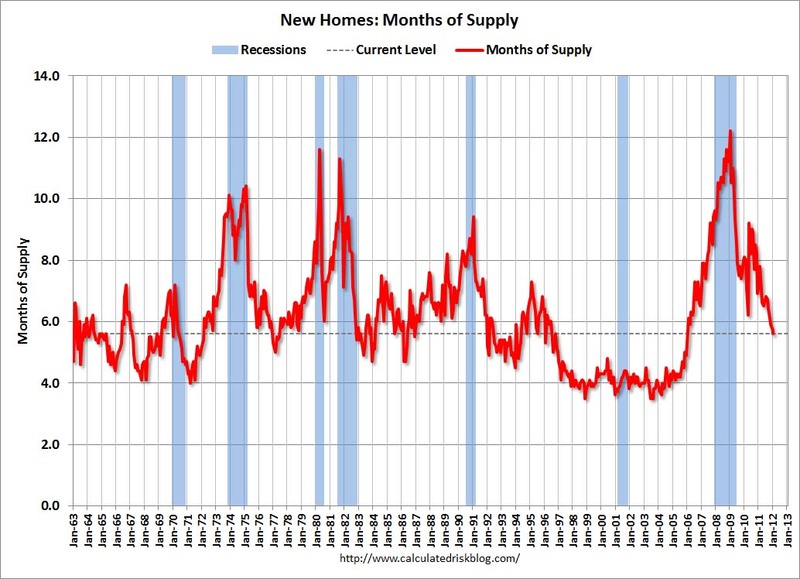 The months of supply shows that current supply is at a historically appropriate level. Existing home sales -- which were very distorted by the home buyer tax credit -- have actually been remarkably steady over the last year or so. 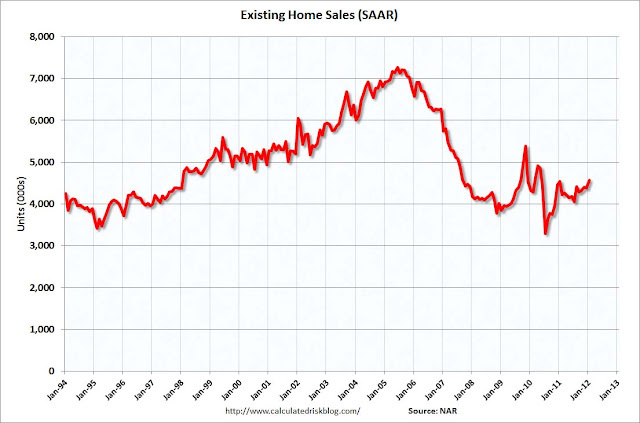 More importantly, sales are in an upswing, although that's actually a relative term. 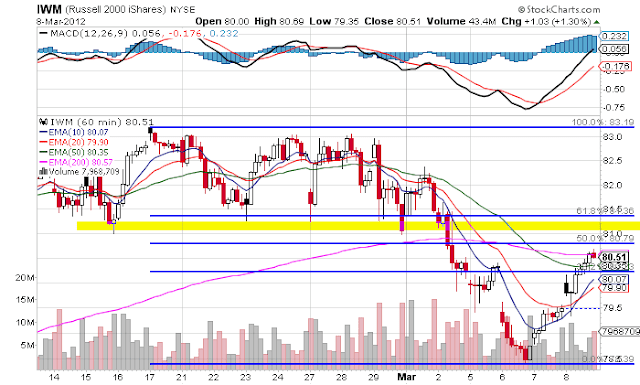 I wouldn't call the chart encouraging just yet, but it's certainly not discouraging. inventory is still high from the "months of available supply" perspective. 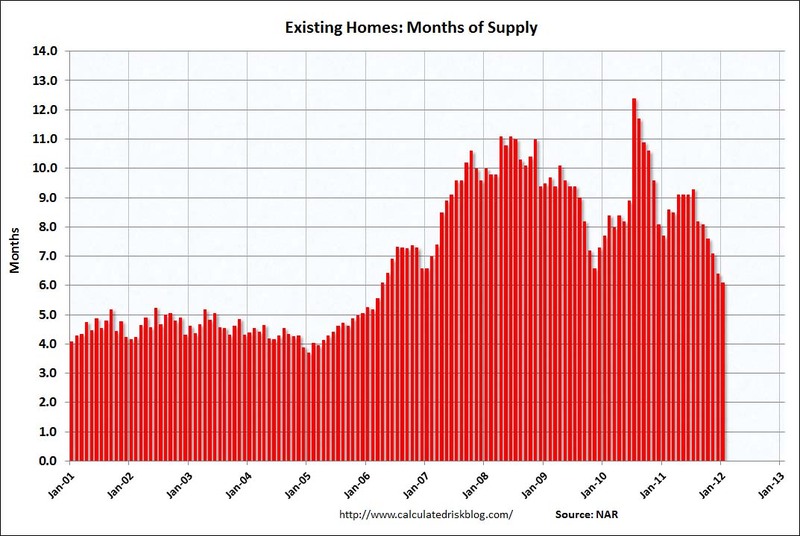 The above statistics indicate the housing market is far closer to equilibrium than before. 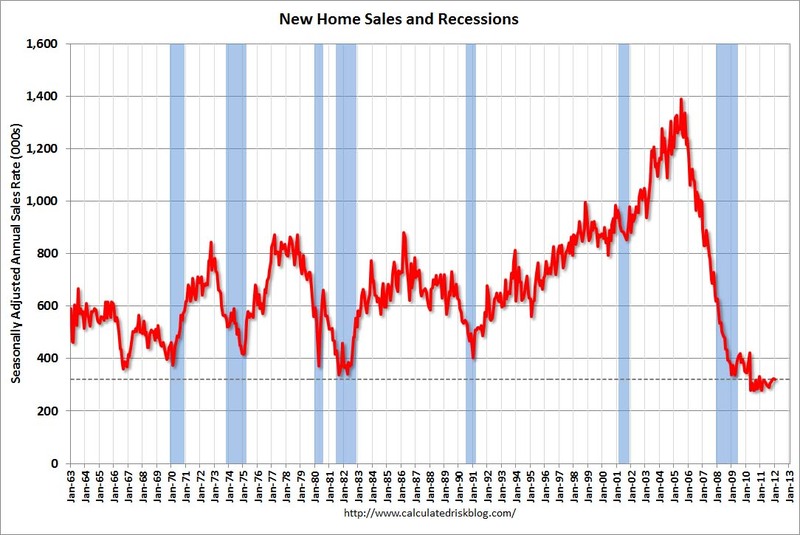 The new home market is actually looking pretty good, while the existing home market has a bit of room to move before we see a bottom. Boy -- this is a great graph from CR. Real house prices less CPI (without its housing component). 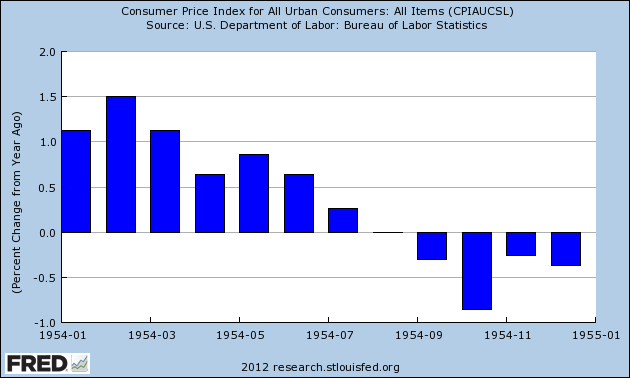 This shows that prices are in a downward track still. However, they area approaching far more normal levels. The new home market has bottomed and is waiting for a rebound. 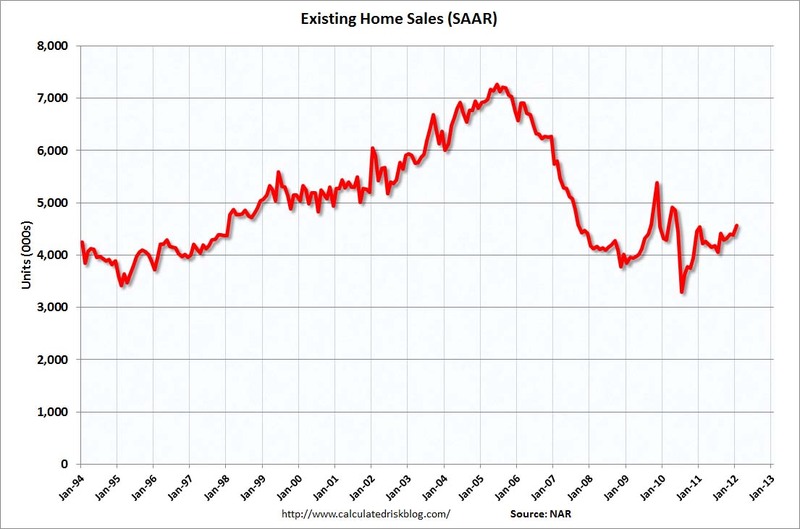 The existing home market is looking OK, but not great. 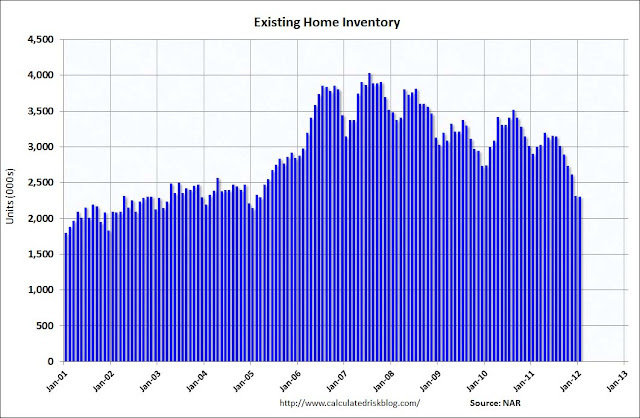 And, both markets are are at far better overall inventory levels. Home prices (adjusted for inflation) show we still have a ways to go on prices.